NEW ZEALAND’S HERITAGE vol 7. PART 95. At 11.30 a.m. on May 29 1953, two men stood for the first time in history on the summit of the world’s highest mountain, Everest, known to the Tibetans as Chomolungma. One was Edmund Hillary, soon to be Sir Edmund Hillary, a 33-year-old beekeeper from New Zealand, the other the Sherpa sirdar from eastern Nepal, Tenzing Norkay. The culmination of decades of effort by more than a dozen expeditions, this 1953 achievement will be remembered so long as there are mountains for men to look at, or challenges to rouse the always questing human spirit. In the moment of triumph, John Hunt and his team must also have remembered those who went before- Mallory and Irvine, who vanished forever high on the North East ridge of the mountain in 1924; Norton and Smythe, who climbed to the limits of their endurance in the expeditions of 1924 and 1933 respectively; Shipton, who led the reconnaissance of 1951 and solved the question of the route to follow on the mountain; the Swiss guide, Raymond Lambert, who with Tenzing had climbed high above the South Col the previous year, and Bourdillon and Evans, who reached the South Summit on May 26. Fortified by the memory of those who had struggled before them, and by the high endeavour of their companions on the Everest expedition, Hillary and Tenzing were able to make that final great effort- a greater effort, because of the daunting power of the unknown, than that required on any subsequent climb of the mountain. As Sir John Hunt has written, “the story of the ascent of Everest is one of teamwork”. Philip Temple is the author of The World at Their Feet (1968) on climbing expeditions by New Zealanders on the great peaks of the world, and Mantle of the Skies (1971) on the Southern Alps. Conon Fraser is a producer with the National Film Unit whose book Looking at New Zealand (1969) was based on his television series. Bruce Mason’s plays include The Pohutukawa Tree (1960) and Awatea (1970); he was a founder of Wellington’s Downstage Theatre. Graham Butterworth, a history lecturer at Massey University, wrote on Sir James Carroll in Part 65, Sir Maui Pomare in Part 71, and Sir Peter Buck in Part 72. Peggy Burton, author of a centennial history of the New Zealand Geological Survey, is a history graduate of Oxford University. Until the 1960s nobody doubted that rugby football would always be New Zealand’s national sport. But questions as to the sportsmanship of the hard-driving, win at all costs approach to the game began to arise as far back as the Army Kiwis matches at the end of World War II. The question of sporting links with South Africa divided national opinion on whether moral issues should be set aside for the sake of a game. Terry McLean, one of the New Zealand’s best-known rugby journalists, considers these matters in an article on rugby since the war. In the post-war years, flying ceased to be a luxury and became a practical and convenient way to travel. R. T. Alexander, writing on civil aviation, shows how new uses were found for aircraft. Stewart Island is one of the last areas of the Dominion to retain its character from earliest times; Sheila Natusch writes on “The Anchor of Maui”. New Zealand’s links with the Antarctic continent go back to Robert Falcon Scott’s expeditions in the early years of the century and those of the American explorer Admiral Evelyn Byrd. In an article on the Ross Dependency, Graham Billing shows that until scientists began to make investigations in the 1950s the Dominion regarded the area as valueless wasteland. A. R. D. Fairburn was a wine enthusiast, a composter, a boatbuilder, an indefatigable newspaper letter-writer; he was also, as Denis Glover recalls in a profile, a satirist and one of the country’s finest poets. New Zealand’s Heritage is published weekly, the most complete historical document of New Zealand yet published. It builds up week by week and magnificent binders are available so that each weekly Part builds into a fully encyclopaedia that you will keep and refer to always. Your New Zealand’s Heritage encyclopaedia will contain more than 2,500 pages, 1,250,000 words and over 5,000 photographs, drawings, maps, charts and other illustrations in colour and black-and-white. Your encyclopaedia takes you from the days of the early Maoris, right up to the New Zealand of today. 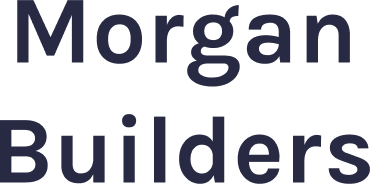 It is filled with all the major developments and people that have made New Zealand what it is. Activity sheets are given free each week. These Activity Sheets are full of the type of information, colour pages, maps and illustrations that will make your school activities more interesting. Back copies of New Zealand’s Heritage are always available from your newsagent or your bookseller so that you will be able to build a full collection to keep in your magnificent binders. Printed in Australia by John Sands Pty. Ltd. The Southern Alps were the training ground for the conqueror of the world’s highest peak and for other climbers who contributed to the 1953 expedition’s success. The first ascent of the world’s highest mountain was both a climax in the gathering strength of New Zealand mountaineering, and the elevation to prominence of a figure who has since brought much prestige and respect to his country. In the 20 years since the ascent of Everest New Zealand mountaineers, with and without Ed Hillary, have climbed with success in every part of the world, stimulated and given practical assistance by his achievement on the 1953 expedition. For Hillary himself, being first on Everest meant assumption- almost reluctantly- of a leadership role not only in mountaineering but also in social and philanthropic fields. Hillary was not the first New Zealander on an Everest expedition; and to understand the basis and framework of his achievement one must return to 1935 and the period of abortive British struggles to climb the mountain by its northern, Tibetan approaches. That year one of the great Himalayan explorers, Eric Shipton, took a small reconnaissance team to examine the mountain’s northern route under monsoon conditions and to assess and train new Everest climbers. One of these was L. V. (“Dan”) Bryant from New Plymouth. Bryant was a strong, ebullient climber with a reputation in both the Southern and European Alps. He performed well on the peaks around Everest but found it difficult to acclimatise to the thin air of high altitude. In the days when use of oxygen on Himalayan peaks was thought to be “hardly cricket”, this disability effectively thwarted Bryant’s ambition to join the big 1936 attempt on Everest. Yet Bryant demonstrated qualities of toughness, good humour and adaptability under expedition conditions that played a crucial part in the selection of New Zealanders for Everest climbs of the 1950s. In 1951, “entirely due to the great respect and liking I had formed for Dan Bryant in 1935”, Eric Shipton agreed to the inclusion of two New Zealanders unknown to him in his new reconnaissance of the mountain’s southern flanks. Tenzing Norgay photographed Edmund Hillary on the summit of Mount Everest, May 29 1953.
routes and new techniques on the most difficult peaks of the Southern Alps. In 1951, Ed Hillary was 32 and an apiarist at Papakura. 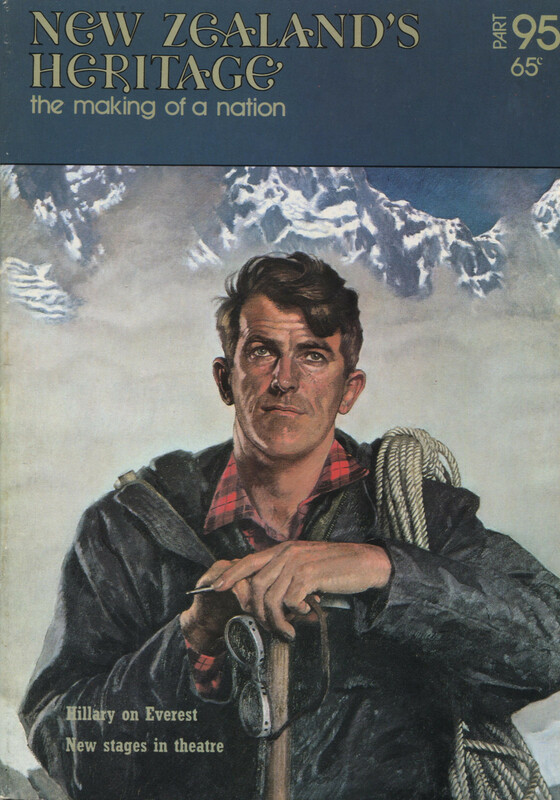 Although enthusiastic for climbing from the first time he visited Mount Cook in 1940, war delayed his plans and he did not begin high climbing until January 1946. His work as an apiarist caused difficulties, too, in that the height of the honey season coincided with the Christmas-New Year holidays. When Hillary was free to go to Mount Cook most of his likely climbing companions were back at work or university. This had a significant bearing on Hillary’s alpine career; with few amateur companions, he was forced to employ professionals. In particular, Hillary developed a strong relationship with the Hermitage guide Harry Ayres. The best ice-climber of his day. 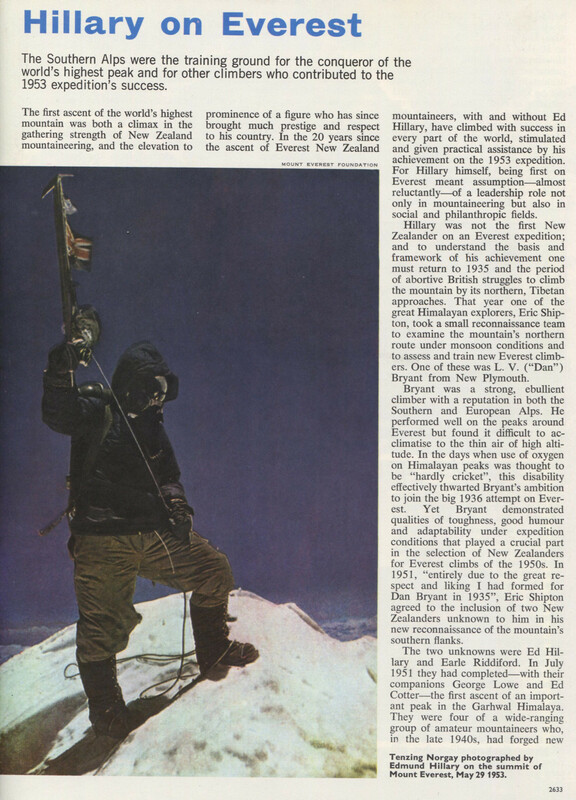 Ayres taught Hillary skills and attitudes that fit him ideally for subsequent forays on Himalayan snow and ice. 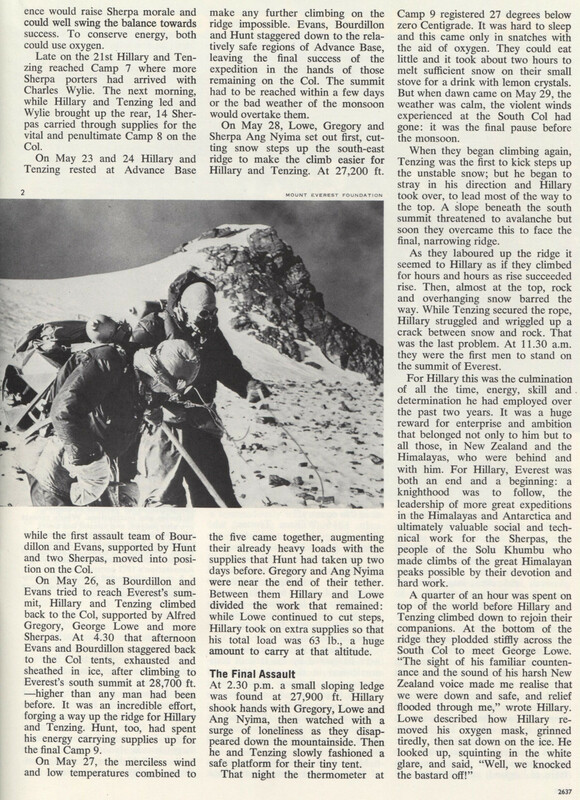 Together Hillary and Ayres climbed many of New Zealand’s major peaks. Their most notable achievement was the first ascent of the south ridge of Mount Cook, a climb that still rates highly even in the era that has seen the ascent of the Caroline Face. Although Hillary learnt many skills from Ayres, climbing with a guide inhibited his development as a route-finder and leader. Hillary was tall (6ft. 2in. ), big-framed, dynamic and enthusiastic but when he first went to the Himalayas with Riddiford, he had neither the inclination nor experience to take a pre-eminent role in planning and leadership. But he was a vital asset to the 1951 party: his strength and energy were outstanding and he discovered that he acclimatised well to high altitude. 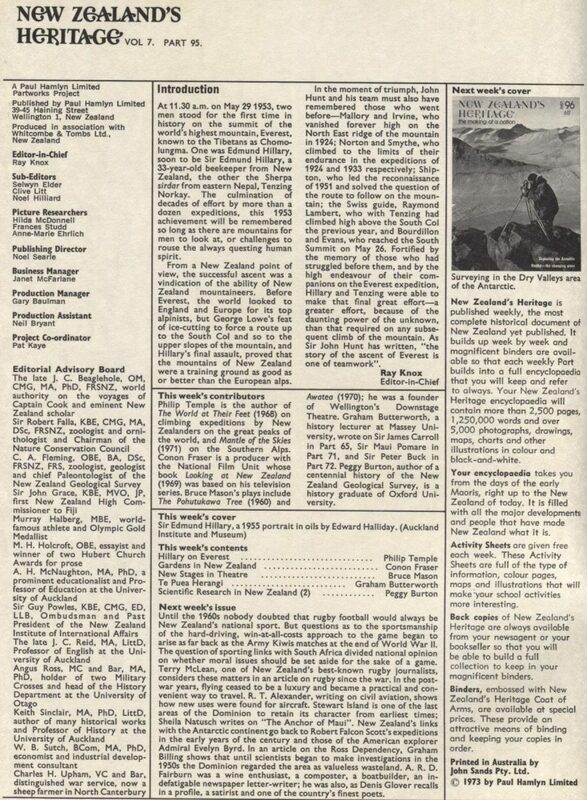 When officials of the New Zealand Alpine Club heard that Himalayan Committee of the English Alpine Club and the Royal Geographical Society were sending an exploratory party to Everest under Shipton, they cabled him, suggesting he include two of the New Zealanders in Garhwal. Because of Shipton’s enduring regard for Dan Bryant, Hillary and Riddiford were able to join the British team in Nepal. In September 1951 the party pushed through to the Sherpa country of the Solu Khumbu and the Khumbu Glacier approaches to Everest. Nepal had been open to foreign visitors for only two years and Shipton’s party was the first to examine closely this new route. The Khumbu Glacier had its nevée, or source, in the Western Cwm, an enormous mountain cirque surrounded by the walls of Everes (29,002 ft.), Lhotse (27,890 ft. at its head), and Nuptse (25,850 ft.). To reach this nevée, a ferocious icefall had to be negotiated, where the glacier tumbled down between the constricting sides of Everest and Nuptse. The lowest point of Everest’s south-east ridge, the South Col, could be reached only by climbing up from the head of the Cwm across the ice face of Lhotse. The brief of Shipton’s team was to ascertain if this projected route was feasible for a large, slow-moving expedition. They fulfilled the brief admirably, providing satisfactory answers to most of the problems that beset Everest planners in London. A route could be made through the Khumbu Icefall; the South Col probably could be reached from the head of the Cwm. The only unknown quantity was the south-east ridge above the Col which was hidden from the reconnaissance party by the huge shoulders of Everest. To provide these answers the party had to penetrate the icefall as far as the Cwm entrance. In this endeavour Hillary and Riddiford, their Garhwal Sherpa Pasang, and Shipton played the most prominent roles. The New Zealanders, from their training in the Southern Alps, revealed an expertise and flair for exploring the unknown, broken ice country that set them apart from their companions. To Shipton it was clear that they should be included in future Everest expeditions. 1 New Zealand climbers en route to the Himalayas in 1951: from left, Edmund Hillary, Ed Cotter, George Lowe, and Earle Riddiford. 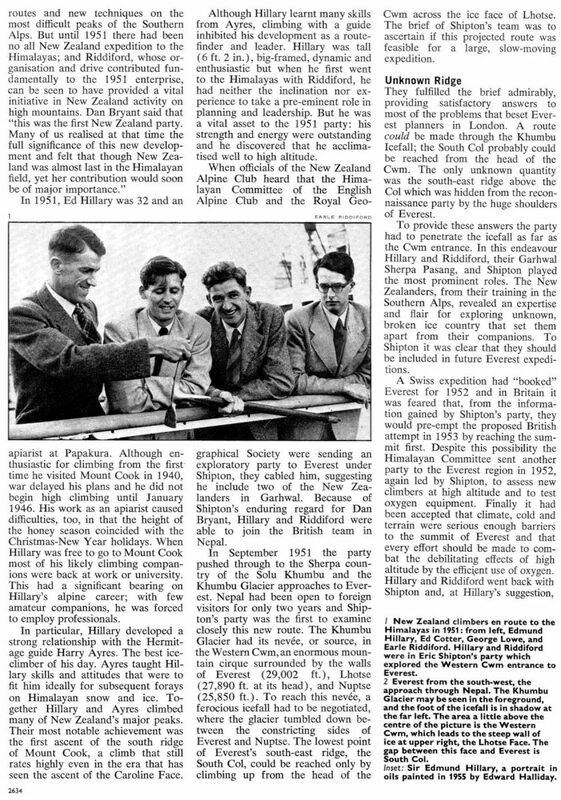 Hillary and Riddiford were in Eric Shipton’s party which explored the Western Cwm Entrance to Everest. 2 Everest from the south-west, the approach through Nepal. The Khumbu Glacier may be seen in the foreground, and the foot of the icefall is in shadow at the far left. The area a little above the centre of the picture is the Western Cwm, which leads to the steep wall fo ice at upper right, the Lhotse Face. The gap between this face and Everest is South Col.
Inset: Sir Edmund Hillary, a portrait in oils painted in 1955 by Edward Halliday. they were joined by George Lowe who had been in the Garhwal party. The 1952 expedition was only a partial success. The attempt on Cho Oyu (26,750 ft.) never got off the ground; sickness was rife and Riddiford had to return to New Zealand with a back injury. The highest point reached by the expedition was 22,600 ft. and this by Hillary and Lowe who scaled a number of unclimbed peaks and made an exceptionally difficult pass corssing to the Tibetan regions of Everest. Though the British activities were disappointing, there was comfort in the knowledge, by thte end of the year, that both Swiss attempts on Everest had failed. The way was clear for an all-out British attempt in the pre-monsoon period of 1953. In September 1952 Shipton, after disagreement with the Himalayan Committee over planning and methods, stood down from leadership of the 1953 expedition and his place was taken by Colonel John Hunt. Hunt’s team consisted of nine climbers, a doctor, a physiologist and a cameraman. Two of the climbers were Hillary and Lower. The size of the expedition, and the “military” approach to its planning and equipping, showed that the British intended making no mistake about putting two men on top of Everest in the second half of May: the “quiet” period before the onset of the monsoon. Three hundred and fifty porters and 34 Sherpas, headed by Sirdar Tenzing Norgay, moved the expedition to the Solu Khumbu in March 1953. On April 9 Hunt send Hillary, with Lowe, George Band and Mike Westmacott, to find a safe route through the Khumbu Icefall. Hillary found the icefall vastly changed and more difficult than in 1951. Swiss flags which had marked a safe path the year before were now perched on inaccessible ice towers or jutted from the sides of massive fallen blocks. Hillary’s problem was compounded by the fact that a site had to be found in the icefall for a camp intermediate to Base and the first camp in the comparatively level region of the Cwm. In turn, Lowe, Band and Westmacott fell ill from stomach ailments or the effects of high altitude. But Hillary always forced on, making a way through the incredibly contorted ice, here and there labelled with whimsical names- like “Hillary’s Horror” of “Hellfire Alley”- That belied the real dangers and difficulties. By April 15, the way to Camp 2 in the icefall was clear. Spurred by the knowledge that Hunt would soon be there, Hillary, Lowe and Band pushed to the top of the icefall on the 17th; on the same afternoon Hillary was able to show Hunt that the route to the Cwm was open. It was obvious now that Hillary had matured beyond the strong, god-natured cobber, content to follow a lead. His expeditions in the Himalayas since early 1951 had brought the realisation that physically he was well fitted and attuned to high altitude climbing. 1 George Lowe, who did vital work cutting steps up the Lhotse Face to the South Col.
2 Charles Evans and Tom Bourdillon at South Col after their unsuccessful attempt at Everest on May 26 1953. This, with his experience of Himalayan conditions and particular knowledge of Everest, gave him a clear advantage over most of his companions, and brought a responsibility to make and suggest initiatives as the Everest attempt reached its climax. Shipton had said, before the expedition began, that Hillary was a real “goer” and would be a very strong contender for the eventual summit team. By the end of April the Advance Base of Camp 4 was established at 21,200 ft. in the Western Cwm. Between May 2 and 6 Charles Evans and Tom Bourdillon made probes up the Lhotse Face towards the South Col, reaching a height of 23,500 ft. They established Camp 5 (22,000 ft.) at the foot of the face and Camp 6 a thousand feet higher. But the South Col lay at nearly 26,000 ft. and they were now in the altitude region where physical and mental deterioration afflicted everyone regardless of the use of oxygen to boost energy. Evans and Bourdillon had used closed-circuit oxygen sets on their Lhotse Face work. These were more complicated and less numerous than the open-circuit sets with which the expedition was mostly equipped. At the beginning of May Hillary, who was chafing at monotonous work in the icefall, suggested that the open- circuit sets be thoroughly tested in a fast “oxygen run” from Base to Advance Base and back in one day. He teamed with Tenzing Norgay for the first time. On May 2 they climbed the 3,300 ft. and five miles through the icefall and Cwm in only five hours, and returned without oxygen in three and a half. This “oxygen run” brought home three strong points: open-circuit oxygen was efficient and effective; Hillary and Tenzing made a strong team; they were the likeliest contenders for the summit. In the middle of May the expedition almost foundered. George Lowe was given the task of cutting a route suitable for Sherpa porters across the Lhotse Face to the South Col. His assistants Band and Westmacott dropped out early from sickness, and Lowe was left to shoulder the burden with the help of only one Sherpa. Without oxygen, Lowe’s effort- great though it was- steadily weakened. By May 19 the position was critical. Only two weeks were left before the monsoon could be expected. Hillary argued strongly with Hunt that Lowe should be brought off the face and replaced. But Hunt could not afford to expend the energies of the few fit men he had left for the assaults on the summit. 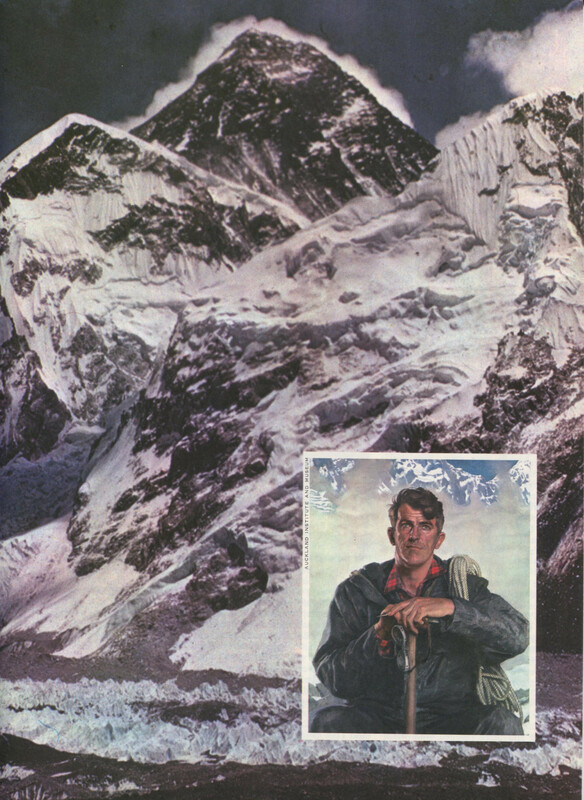 On May 20 Wilfrid Noyce took a group of laden Sherpas to Lowe’s Camp 7 at 24,000 ft. Though the route to the South Col was unfinished, the climbing plan must proceed. On May 21, the main group of Sherpas refused to go on. But Noyce with one Sherpa climbed up to the Col, determined to make the breakthrough. Even so the other Sherpas must go up or down because food supplies were limited at Camp 7 and the men could not stay there more than one night. Hillary went to Hunt’s tent and persuaded him that he should take Tenzing to Camp 7. Tenzing’s presence would raise Sherpa morale and could well swing the balance towards success. To conserve energy, both could use oxygen. Late on the 21st Hillary and Tenzing reached Camp 7 where more Sherpa porters had arrived with Charles Wylie. The next morning while Hillary and Tenzing led and Wylie brought up the rear, 14 Sherpas carried through supplies for the vital and penultimate Camp 8 on the Col.
On May 23 and 24 Hillary and Tenzing rested at Advance Base while the first assault team of Bourdillon and Evans, supported by Hunt and two Sherpas, moved into position on the Col.
On May 26, as Bourdillon and Evans tried to reach Everest’s summit, Hillary and Tenzing climbed back to the Col, supported by Alfred Gregory, George Lowe and more Sherpas. At 4.0 that afternoon Evans and Bourdillon staggered back to the Col tents, exhausted and sheathed in ice, after climbing to Everest’s south summit at 28,700 ft.- higher than any man had been before. It was an incredible effort, forging a way up the ridge for Hillary and Tenzing. Hunt, too, had spent his energy carrying supplies up for the final Camp 9. On May 27, the merciless wind and low temperatures combined to make any further climbing on the ridge impossible. Evans, Bourdillon and Hunt staggered down to the relatively safe regions of Advance Base, leaving the final success of the expedition in the hands of those remaining on the Col. The summit had to be reached within a few days or the bad weather of the monsoon would overtake them. On May 28, Lowe, Gregory and Sherpa Ang Nyima set out first, cutting snow steps up the south-east ridge to make the climb easier for Hillary and Tenzing. At 27,200 ft. the five came together, augmenting their already heavy loads with the supplies that Hunt had taken up two days before. Gregory and Ang Nyima were near the end of their tether. Between them Hillary and Lowe divided the work that remained: while Lowe continued to cut steps, Hillary took on extra supplies so that his total load was 63 lb., a huge amount to carry at that altitude. 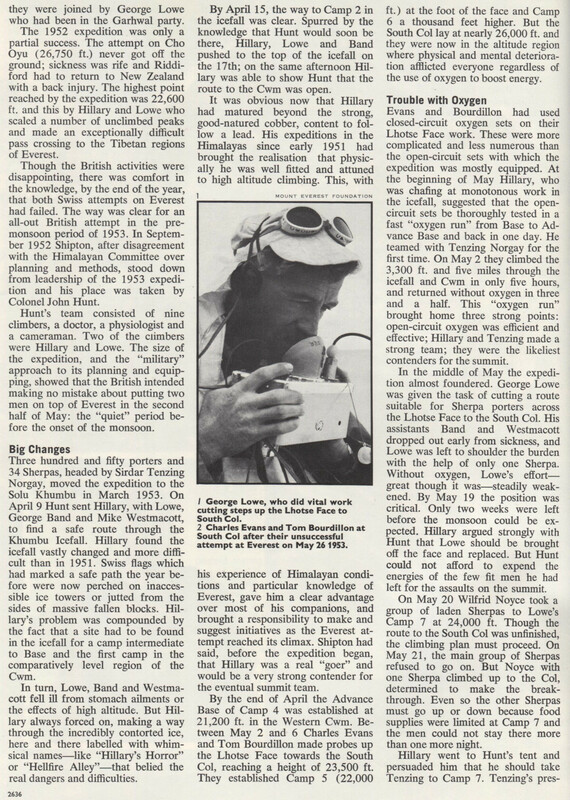 At 2.30 p.m. a small sloping ledge was found at 27,900 ft. Hillary shook hands with Gregory, Lowe and Ang Nyima, then watched with a surge of loneliness as they disappeared down the mountainside. Then he and Tenzing slowly fashioned a safe platform for their tiny tent. That night the thermometer at Camp 9 registered 27 degrees below zero Centigrade. It was hard to sleep and this came only in snatches with the aid of oxygen. They could eat little and it took about two hours to melt sufficient snow on their small stove for a drink with lemon crystals. But when dawn came on May 29, the weather was calm, the violent winds experienced at the South Col had gone: it was the final pause before the monsoon. When they began climbing again, Tenzing was the first to kick steps up the unstable snow; but he began to stray in direction and Hillary took over, to lead most of the way to the top. A slope beneath the south summit threatened to avalanche but soon they overcame this to face the final narrowing ridge. As they laboured up the ridge it seemed to Hillary as if they climbed for hours and hours as rise succeeded to rise. Then, almost at the top, rock and overhanging snow barred the way. While Tenzing secured the rope, Hillary struggled and wriggled up a crack between snow and rock. That was the last problem. At 11.30 a.m. they were the first men to stand on the summit of Everest. For Hillary this was the culmination of all the time, energy, skill and determination he had employed over the past two years. It was a huge reward for enterprise and ambition that belonged not only to him but to all those, in New Zealand and the Himalayas, who were behind and with him. For Hillary, Everest was both an end and a beginning: a knighthood was to follow, the leadership of more great expeditions in the Himalayas and Antarctica and ultimately valuable social and technical work for the Sherpas, the people of the Solu Khumbu who made climbs of the great Himalayan peaks possible by their devotion and hard work.